Out of print. All proceeds from this anthology benefited the Shirley Jackson Awards. Jack Haringa. The very name strikes fear in the hearts of the grammatically challenged. But fear not, semicolon abusers and malapropists! 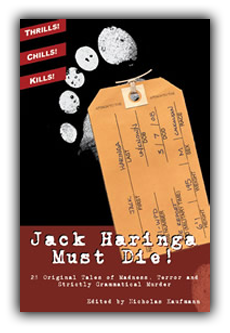 The tables are turned in Jack Haringa Must Die!, which collects the very best Haringa death scenes and tales from Jack Ketchum, Christopher Golden, Brian Keene, Craig Shaw Gardner, James A. Moore, Nick Mamatas, Mary SanGiovanni, Lee Thomas, Bev Vincent and many more. Edited by Nicholas Kaufmann, with an introduction by Paul G. Tremblay and an afterword by Jack Haringa himself, this fundraising anthology will thrill you, scare you, tickle your funny bone and have you resounding the battle cry: Jack Haringa must die!